When you’re following a low-carb diet, the list of foods to avoid can seem daunting. If you're new to diets like Keto which take the focus away from carbs and ask your body to rely on fat for energy, adjusting can take time (not just metabolically, but mentally too). Focusing on fresh produce, healthy fats, and lean protein ensures you’re getting adequate energy and nutrition and helps reduce cravings for starches and grains. Instead of thinking about the foods you’re cutting out, try thinking of new ways to (literally) spice up the foods you eat regularly. Getting smarter about condiments and other cooking supplies can help you do just that. Preparation, including seasoning of low-carb diet staples (such as fresh veggies), is a great way to add a variety of tastes and textures to your diet. A "secret ingredient" to staying motivated and satisfied on a low-carb diet is a fully, and thoughtfully, stocked pantry. Condiments like vinegar, mustard, hot sauce, chicken broth, and mayonnaise made with olive oil have few, if any, carbohydrates. As long as you know what to look for (and what to avoid) you'll be surprised by how much you can do with a few simple ingredients. Many of the most versatile spices you can have in your kitchen are widely available, affordable, and don't require any special storage or preparation. When experimenting with a new diet, get into the habit of reading food labels. If you're adjusting to a low-carb diet, this practice is especially important as you fill your pantry. Many sauces, for example, are high in sugar (which would count toward your carb intake for the day). However, these added sugars can be tricky to spot on food labels because they often go by different names. If you look at the back of a food package and don't see the word "sugar" but you do see "evaporated cane juice," "mannose", or "dextrin", you might not realize these ingredients are sugar. Once you become familiar with the many aliases of sugar, you’ll be able to make more informed choices about what you eat. Keep in mind that even if a product doesn't have many carbs or added sugars, other nutritional info, such as sodium content, is also important to note. For example, while Tamari Soy Sauce has no carbs or sugar, it does have 980mg of sodium per serving—meaning that even though it's a low-carb option, it might not be the best choice for someone watching their salt intake. Even if you're not adhering to a low-sodium diet, condiments high in sodium should be used in moderation. Another key to success with low-carb diets is making sure you’re getting enough healthy fat. Some fats have higher nutritional value than others. Most low-carb diets advise avoiding oils high in omega-6 fats, including soy, corn, most safflower, and sunflower. Partially hydrogenated oils, which contain trans fats, don't add nutrition to your diet and can have a negative effect on your health. If you're committed to a low-carb diet you might be resigned to giving up sweets—especially baked goods. Depending on the ingredients you use, as well as keeping an eye on portion size, there are several ways to satisfy a sweet tooth that are low-carb. When you’re watching your carbs, knowing what foods to avoid is just as important as knowing which ones to eat. This is especially true if you’d like to add condiments to the mix. Raw veggie sticks can be a great snack or lunchbox item on their own, but you can take them to the next level by adding a dollop of dip or drizzle of sauce. Pesto and tamari also work well in hot meals like stir-fries or veggie-noodle pasta dishes. Mayonnaise: look for brands high in monounsaturated fat rather than polyunsaturated fat or soy oil. 1 tablespoon of Hellman's Mayo with Olive Oil has less than 1g of carbs. Mustard: avoid sweetened varieties such as honey mustard. Heinz Spicy Brown Mustard has 0g of carbs. No matter what you're cooking, even something as simple as a little salt and pepper can make even any meal much more interesting to your taste buds. Herbs, whether fresh or dry, are also versatile additions to many dishes. While lettuce is often characterized as stereotypical "diet food," salads can be a filling, balanced, and nutrient-rich meal choice. Greens are also a quick and easy vehicle for healthy fats, like olive oil. There are, however, many salad dressings that add less healthy fats and may have a lot of sugar. If you check labels and ingredient lists before you buy, you'll find there are many suitable low-carb, low-sugar options. If you want something even simpler, vinegar (another common pantry staple) can be paired with oils for easy make-your-own dressing. The mix is also great to have on hand for cooking (try drizzling on steamed veggies). Carefully check labels before you buy. Look for sugar-free salad dressings high in monounsaturated fat (like those with olive oil). Cider and wine vinegar come in many flavors, but be careful with infused varieties—those made with fruit may have more sugar. 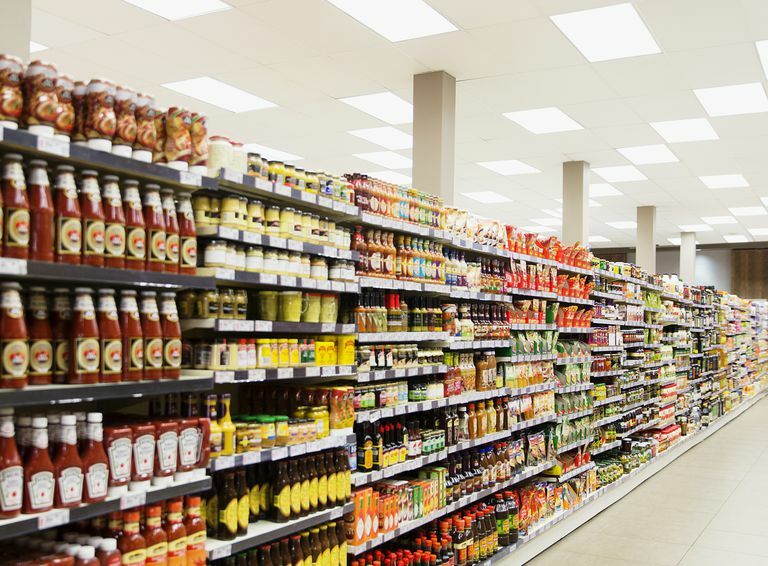 Shoppers often assume the only healthy options of a condiment will be an organic version—brands that may be more costly and not as widely available as the old standbys. While there are plenty of organic choices, their presence on grocery store shelves has shown larger brands there's demand for low-carb, low-fat, or low-sugar alternatives to the classic offerings. Many name brand condiments have adjusted their recipes to develop healthier versions of your favorite sauces, dressings, and oils. In addition to being affordable, these options are also more likely to be in stock at your local grocery store, meaning you won't have to make a trip to a specialty store, coop, or farmer's market to find them. For non-perishable products, you may be able to find additional options to order online. If you find a product you really like and want to fill your pantry, you may also be able to buy it in bulk to save money.